Ok, after the diet, the trip to Europe you have always wanted to take and stopping smoking, what is on your list of new years’ career resolutions? Because the truth is, your career is deserving of some love. Why not make 2018 the year your career is the most successful of all your resolutions? They say New Year is a time for renewal. So why not give some thought to your professional life when setting goals for the upcoming year? In terms of your career, people have nebulous, abstract ideas of what their goals and ambitions are in terms of their career – more money, more satisfaction, more recognition – but drilling down into specifics can be hard. So why not make some very simple goals to achieve that will help you on the way to achieving your career resolutions? Firstly, make time for your continuing professional development. 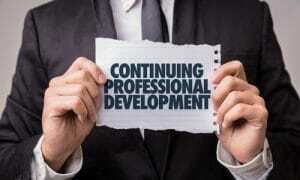 Continuing professional development is important because it ensures you continue to be competent in your profession. It is an ongoing process and continues throughout a professional’s career. It demonstrably shows that you are committed to your career and that you are across all the latest developments and trends in your profession. It will benefit you in your current job, and any future employer will be able to see that you are a candidate who is up to speed in their chosen role. Of course, the ultimate outcome of well planned continuing professional development is that it safeguards the public, the employer, the professional and the professional’s career. Even if it is not mandatory in your current role, take continuing professional development on as a personal responsibility to keep your knowledge and skills current so that you can deliver a high quality of service that meets the requirements of your profession. Secondly, make a commitment to undertake more networking. Do not postpone it any further. It is a new year, so make it a key element of your career resolutions. The next time you attend a conference, gather the courage and approach new people. The truth is, networking seems harder than it actually is. Do not treat networking colleagues as stepping stones to your future; this will seem obvious and ultimately be counterproductive. These are your peers, treat them as such and let work become an organic subject that enters the conversation naturally. This will give way to you building relationships with a bunch of highly interesting, creative, and successful people. The natural knock-on result of this will be opportunity. It will not always be obvious, but it will come. This is because you now in a space where proactive, encouraging dialogue will naturally evolve, and from that prospects will emerge. It really is easier than you imagine. Begin with people you know, colleagues in your immediate circle at work. These people know and trust you, and you trust them. Even if these people offer no direct opportunities, by professionally socialising you will gain the confidence to go to groups outside your immediate circle. Always approach people think how you can help them, never the other way around – that will come, but not if the suspect you are simply trying to leverage information from them. Ask about them, their problems, their aspirations, always find a way to positively contribute to their story. But always do it without expecting anything in return. Networking can be a long process, but the rewards can be immense. Be patient, be positive and it will reap results. These are just two ways you can deliver on your new years’ resolutions and give your career a huge boost in 2018.